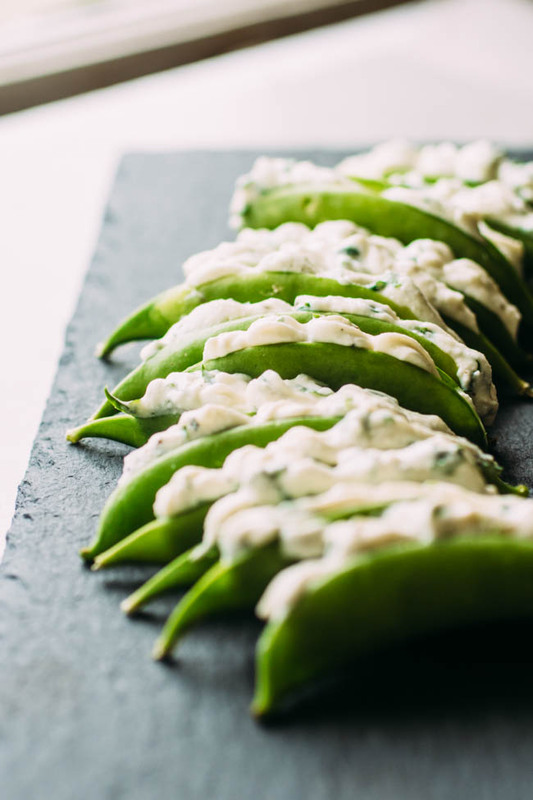 These easy but elegant Herb and Cheese Stuffed Snap Peas are perfect for outdoor entertaining! 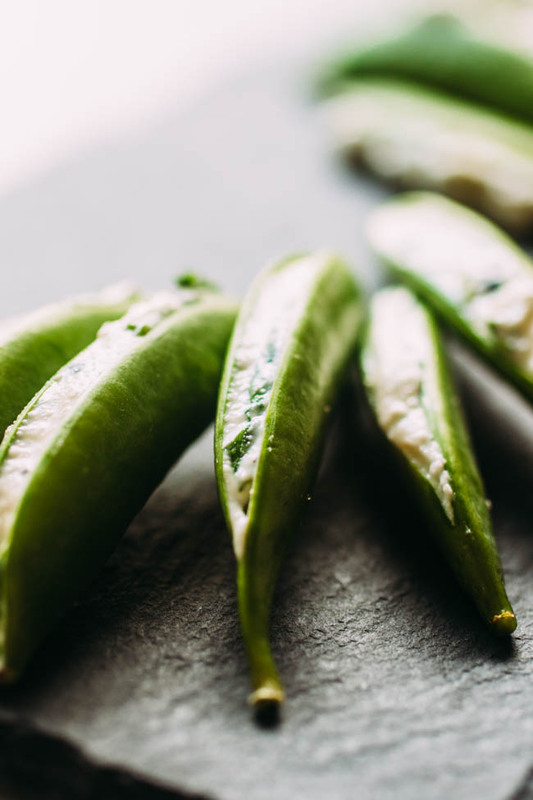 Fresh, crisp pea pods are stuffed with a simple herb and cheese mixture. Vegetarian. This post contains affiliate links, which means if you purchase something I’ll earn a small commission at no cost to you. Thanks for supporting Life As A Strawberry! 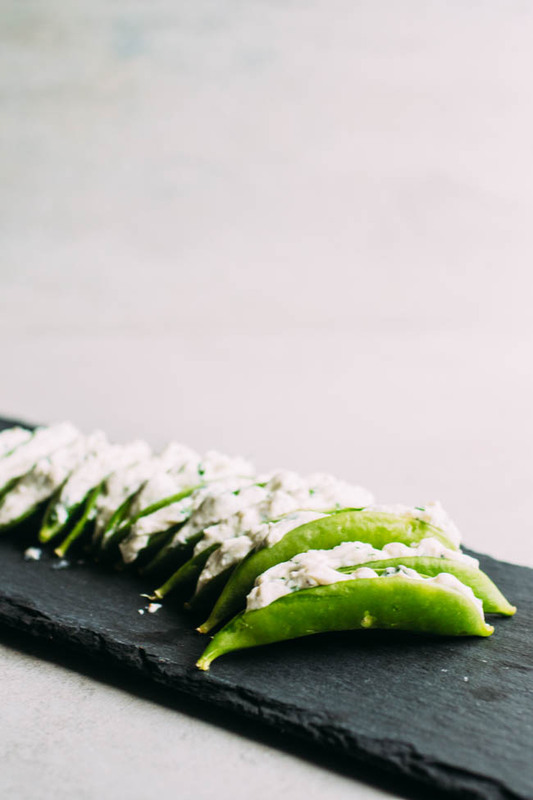 These stuffed snap peas are awesome. They’re one of those perfect summer snacks: crunchy, fresh, light, and (best of all) oven- and stovetop-free. 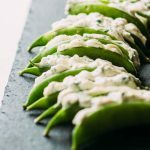 These stuffed snap peas make great appetizers, but in my opinion it is also totally acceptable to eat them all by yourself for lunch. Or dinner. Or dessert. Or as an accompaniment to some really terrible reality TV show you just discovered on Netflix and immediately watched a whole season of because hey, it’s Sunday and hey, you haven’t gotten out of your pajamas and hey, you just made some really great stuffed snap peas and the world is officially your oyster. This is also a great make-ahead option for all those summer potlucks. 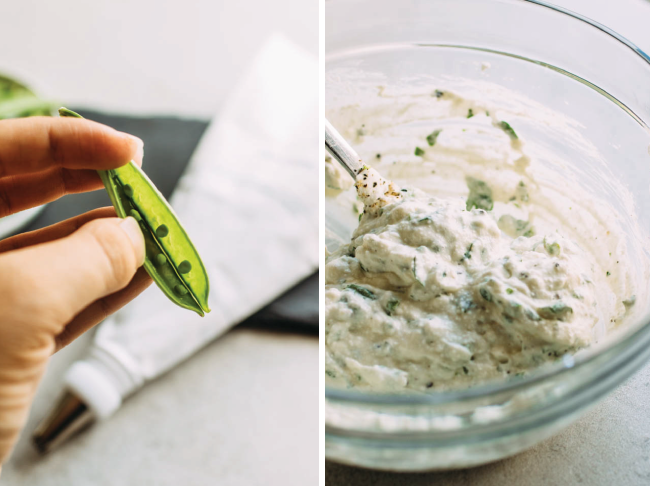 Split the snap peas and mix the cheese filling up to three days ahead of time, and then pipe the cheese into the peas whenever you’re ready to serve. The most time-consuming thing here is splitting the peas – and even that takes just 8 minutes or so. 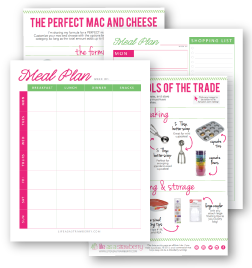 Use any herbs you have on hand here, and switch up the cheeses with any soft cheese you like! Goat cheese and mascarpone are also wonderful in this recipe. 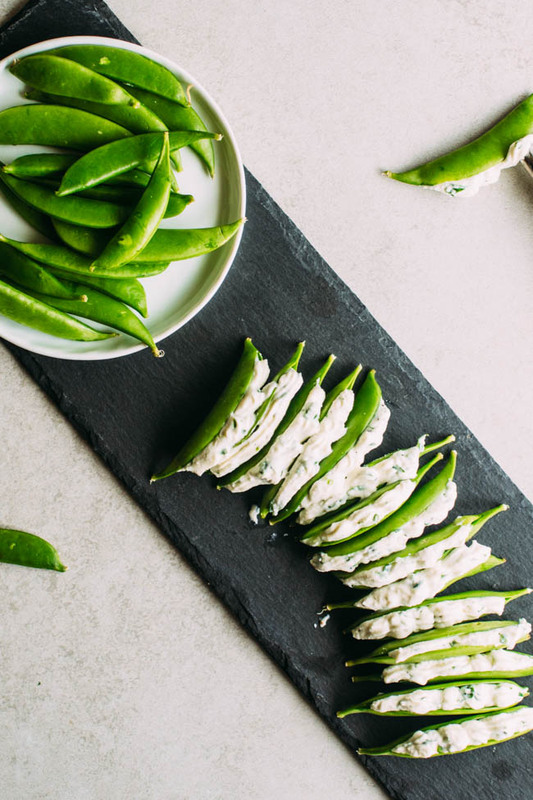 These herb and cheese stuffed snap peas are perfect for summer entertaining. Use a sharp paring knife to split each pea pod down the middle and form a small pocket. In a small bowl, combine herbs, ricotta, cream cheese, lemon juice, salt and pepper. Mix well. Fill a plastic bag or piping bag fitted with a round or star tip (I like this bag from Wilton) with the cheese mixture. Pipe a bit of the cheese mixture into each pea. Eat immediately or store in the fridge for a few hours before you dig in! It can be tough the first few times to get the knife right in the center of the pea so be patient and be prepared to give it a few tries. Insert the knife gently into the seam of each pea and then slowly slice down the center – but be careful not to slice all the way through the pea pod. This can take a bit of practice, but you’ll get the hang of it! Try to keep the knife straight and steady, and slide it through the rest of the pea (it sometimes helps to lay the pea flat on a cutting board and slide the knife through that way!) kind of like you’re opening an envelope. Use any herbs you have on hand here – I like a mix of parsley, chives, basil, and dill. Buy a few extra pea pods the first time you make these so you have a few backups if you accidentally slice all the way through the peas! If it’s particularly hot in your kitchen, you may want to pop the cheese mixture in the fridge for a few minutes before filling the peas so it better holds its shape. You can make this appetizer a day ahead of you like. If you can, I recommend splitting the peas and mix the filling ahead of time, and then piping the cheese into the pea pods when you’re ready to serve. I use a 16 inch pastry bag and one of three piping tips – Wilton 10, Wilton 21, or Wilton 22 – when I make these. Switch out the cheeses if you like – goat cheese and mascarpone are also great in this recipe! Looking for more great summer appetizer inspiration? Try my dijon corn salsa or blackberry goat cheese crostini! Looks good. Love the lemon juice squirt – what a refreshing idea.